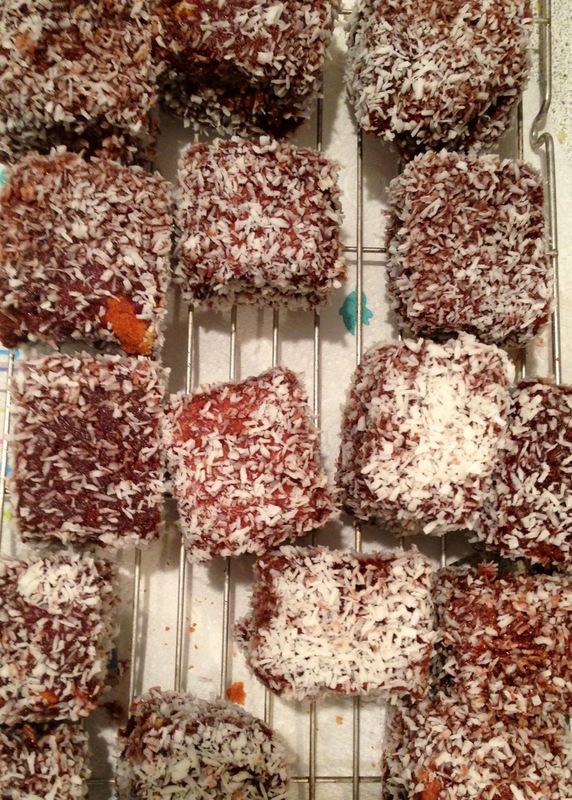 Lamingtons, (so the internet tells me), are very well-known in Australia and often are baked for Australia day. I haven’t gone further than reading posts on when they should be eaten etc as my supportive husband (not Australian) loves them and so the boys and I decided to bake some for his birthday. They are a desiccated coconut covered sponge with a thin chocolate icing (that the coconut sticks to). So if you are not a fan of coconut – then I wouldn’t recommend these. I will share the link to the recipe I used shortly, but thought some info/tips on whether to decide to bake them yourself or not would have been handy to have. Make sure you have a LOT of coconut for the coating as it sticks a lot more than you think and it also depends on what size you cut the sponge to. Once you have cooked, cooled and cut the sponge into squares, they need to go into the fridge for at least 2 hours or overnight. So, if you like me thought it would take 1.5 hours tops from scratch to finish, then it may be worth buying them. Apparently, the sponge needs to be cold in order for the runny icing to stick and the sponge not to break up into bits. Use a skewer to dunk the squares into the hot, melted icing and a spoon to ensure it is covered all over. It then makes it easier to transfer over to the coconut. 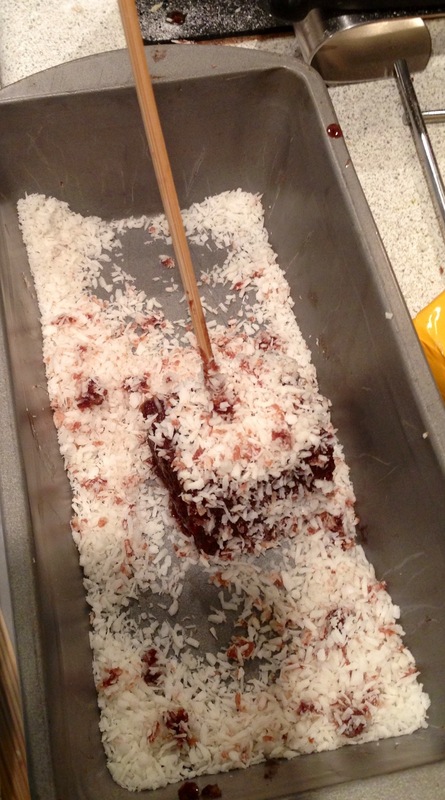 I used a loaf tin for the desiccated coconut. They are fibbing when they say put a newspaper or kitchen roll under the cooling rack to help with dripping icing. The recipe below doesn’t mention how much butter to use in the sponge or icing. I used all 3 tablespoons of butter in the sponge and when I got to the icing part, I couldn’t find out how much butter to use there…so used another 3 tablespoons of butter! Seems to have worked out OK. I also cheated a bit and had 3 eggs instead of the 2 prescribed in the recipe. I love the tip on putting them on a rack to ice! I used a skewer to dunk them in the icing then coconut.